Use this Healing Salve on any cuts, burns, scrapes and scars. Also helpful in providing relief from dry, itchy and chapped skin. At North Whidbey Farm we use this salve almost daily, for all sorts of skin irritations. 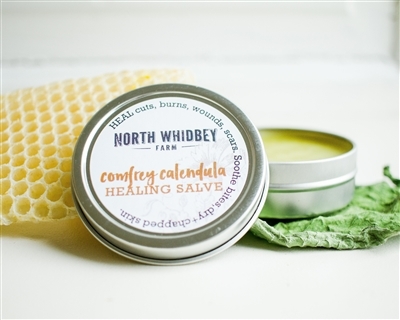 Our customers report this Healing Salve is helping with Psoriasis, chafing, insect bites, dental problems, cuts and scrapes and dry cracked skin. Olive Oil, Sunflower Oil and Avocado Oil infused with Comfrey Leaf, Comfrey Root, Calendula, and Plantain; Local Beeswax; Essential Oil (Lavender, Tea Tree).